Carl Frampton Overcomes a Shaky Start To Decision Alejandro Gonzalez Jr.
IBF Jr. Featherweight champion Scott Quigg was hoping to make a strong impression in his U.S. debut Saturday against relatively unknown Alejandro Gonzalez Jr. Saturday afternoon at the Don Haskins Center in El Paso, Texas. Well, Frampton didn’t exactly make the strong impression he had hoped for, but did enough to retain his title for the second time with a unanimous decision (116-108, 116-108, 115-109) win to defend his title for the second time. Things started very rock for Frampton as thirty-five seconds into round one, the champion went down by way of a straight left jab from Gonzalez. it was a flash knockdown and Frampton got up clear-eyed. However, with fifteen seconds to go in the opening stanza, Frampton (21-0, 14 KOs) went down for a second time by way of a counter right hand from Gonzalez (25-2-2, 15 KOs). Again, Frampton got up clear-eyed, but the Gonzalez established that he was here to fight. 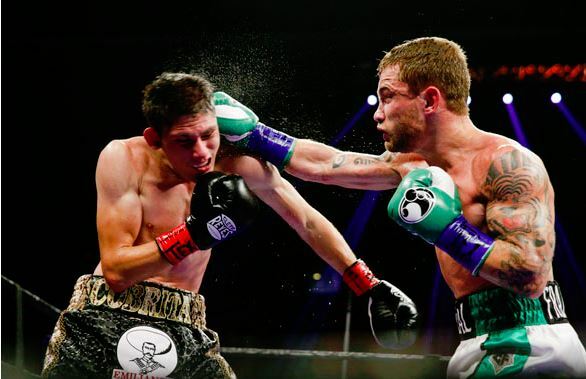 After a close second round, Frampton started to find his way and round three and began to show why he was so highly regarded heading into this bout. The overall class of the defending champ showed itself as the rounds went on. Frampton took advantage of the inexperienced Gonzalez backing the challenger up in the fourth and fifth and got Gonzalez attention in the sixth with the straight right hand and solid uppercuts. Gonzalez fought hard throughout, but Frampton used the momentum gained in the middle rounds win by fairly comfortable margin. 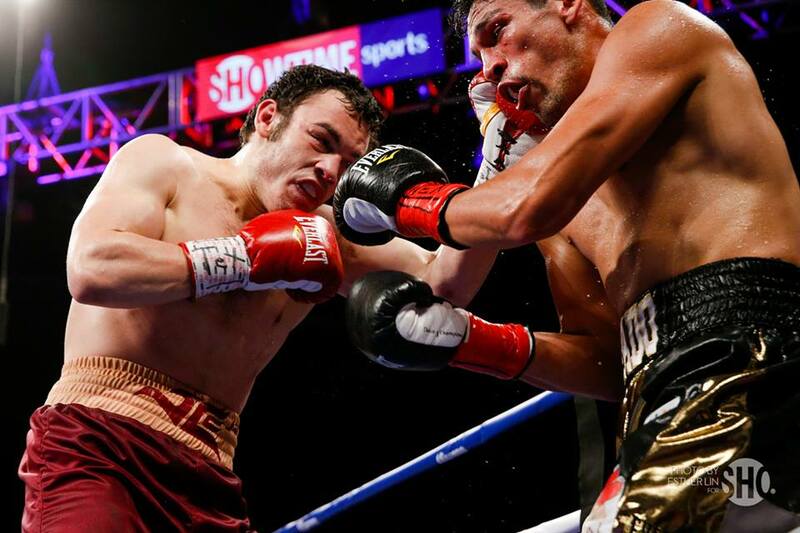 Gonzalez had a point taken away in the eleventh round as a result of continued low blows. Afterwards, Frampton was not happy with his performance. “I didn’t feel great in the first round. I got up from two flash knockdowns though and recovered well. The kid could punch very well,” said Frampton. “The ring canvas was very soft. I couldn’t get up on my toes and that’s my best attribute. I got up and showed courage. I came back and won most of the rounds and gave excitement. I wanted to win by knockout. It didn’t happen. I’m disappointed, but I’ll re-evaluate and move on; onwards and upwards. He hit me low so many times, but you’ve got to deal with that and carry on and that’s what I did.” Frampton also said that he may have taken off too much weight before the bout and intimated a possible move up to Featherweight. As for Alejandro Gonzalez Jr., he’s only 22 years-old and his performance against Frampton showed that he’s better than previously advertised. He is a boxer that folks will definitely want to see again and can become a player in the Jr. Featherweight division. Bottom line, the young kid can fight. Moving forward, this was a nice U.S. debut from Carl Frampton. The fight we want to see of course is a fight against rival and fellow Jr. Featherweight titlist Carl Frampton who destroyed Kiko Martinez on Saturday in Manchester, England. It’s a grudge match that all boxing fans want to happen. Now will it? Well, that’s to be determined. Negotiations between the two camps earlier this year and the two camps could not come to an agreement. Should it not happen, the Jr. Featherweight and Featherweight divisions are so packed with talent that a big bout for Frampton is still very possible against the winner of the upcoming Abner Mares – Leo Santa Cruz or possibly against Guillermo Rigondeaux (currently in negotiations for a fight against Vasyl Lomachenko). However let’s face it folks, let’s hope Carl Frampton – Scott Quigg finally happens. 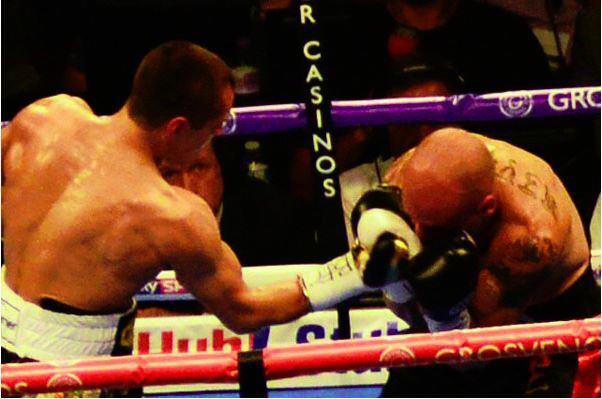 Scott Quigg Makes a Statement Destroying Kiko Martinez in 2!!! Heading into his fight against former IBF Jr. Featherweight Kiko Martinez there were two major questions facing Scott Quigg. 1. Could Quigg score a signature win that would give him the respect that many feel he’s lacking and 2. Can he look as impressive in defeating Martinez as rival Carl Frampton did during his two wins over Martinez (in Feb. 2013 and Sept. 2014). The answer to both questions was an emphatic yes as Quigg scored the most impressive win of his career overwhelming Martinez in two rounds at the Manchester Arena Saturday night in Manchester Arena to successfully defend his WBA ‘regular’ Jr. Featherweight title. Quigg (31-0-2, 23 KOs) began the bout cautiously in round one, fighting exclusively on the back foot while Martinez charged ahead throwing punches in bunches. Based on activity and the aggressive pace that Martinez (32-6, 24 KOs) set early, he clearly won the opening round. At the start of the second round however, Quigg got serious and went to work. Twenty-five into the round Quigg rocked Martinez with a right uppercut and a follow-up combination sent Martinez down. Martinez got up on wobbly legs, but soon went down for a second time after a barrage of punches culminating by a powerful right hand put Martinez down for a second time sixty-one seconds into the round. 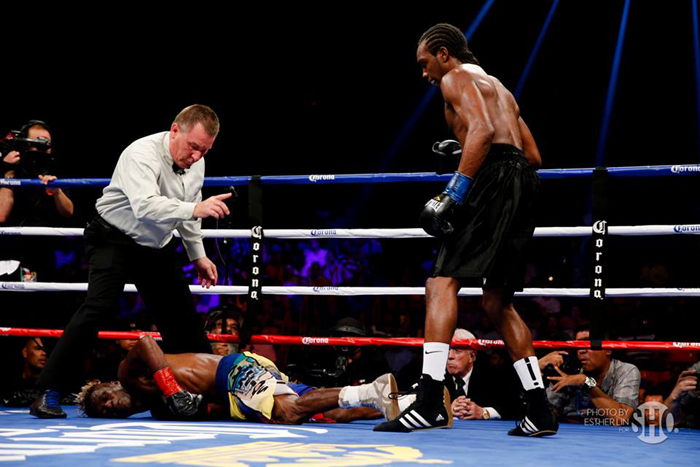 Martinez again rose to his feet, but referee Terry O’Conner had seen enough and called a halt to the bout. This was an emphatic performance by Quigg’s career and pretty solidified himself as the real deal. And given the way he devastated Martinez, the drums will beat even louder for a bout against the aforementioned Frampton (who is the current IBF Jr. Featherweight champion) . Negotiations for a Quigg – Frampton bout failed earlier this year. Hopefully the two camps can come together and finally make this bout happen. It would be a real shame that a bout so many boxing fans are starving for (particularly in the UK) does not take place. WBO Super Middleweight champion “King” Arthur Abraham (43-4, 29 KOs) and Robert Stieglitz fought for the fourth time Saturday at the Gary Weber Stadium in Halle, Germany with Abraham scoring an emphatic sixth round stoppage to retain his belt. And ad a treat, I found a video of the bout for those who have not yet seen the bout. This was indeed a statement win for Abraham, watch and enjoy.